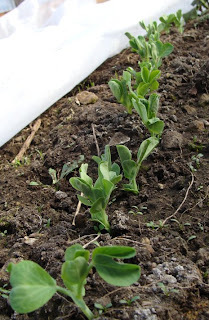 The Lincoln peas I sowed a few days earlier failed to appear and it soon became clear that they had all been consumed by rodents unknown. I don't know why they are so appealing and the other ones aren't. I still had some seeds left, so this time I thought I'd experiment with a chilli deterrent. I ground up three of last year's dried cayenne peppers, added them to a bowl of water and then soaked the peas for a few hours. My idea was that the infusion would make the peas less palatable to whatever was digging them up (although I should note that the chilli-coated bird seed wasn't much of a deterrent to the squirrels). 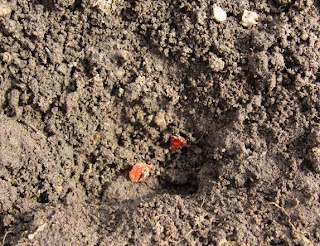 I sowed them in the same spot and then tipped the bits of chilli and the soaking water over the peas before covering them up with soil. This morning, there were some small holes in the soil but it does look as though once the creature hit the layer of chilli fragments, it gave up. Time will tell - I'll report back on whether it worked or not. The slight (and possibly obvious to you) flaw in my method, which only occurred to me after I had covered over the peas, is that those pepper seeds from the dried peppers are probably perfectly viable. Which means that I may well be getting pepper seedlings germinating along with the peas. Oops. Oh well, it's far too early to be sowing peppers in the greenhouse, so even if they do germinate, I doubt they'll last very long! Actually if they do germinate - it will probably be after the peas are done and gone - my sister-in-law had the most magnificent pepper grown from pepper seeds in a jar - just huge. Oh dear... I hope the experiment works! Now I have something else to worry about. When I ever get my beds made and planted I will have to think about rodents. I have just been worrying about deer, squirrels and rabbits. Hope you have found a new deterrent.